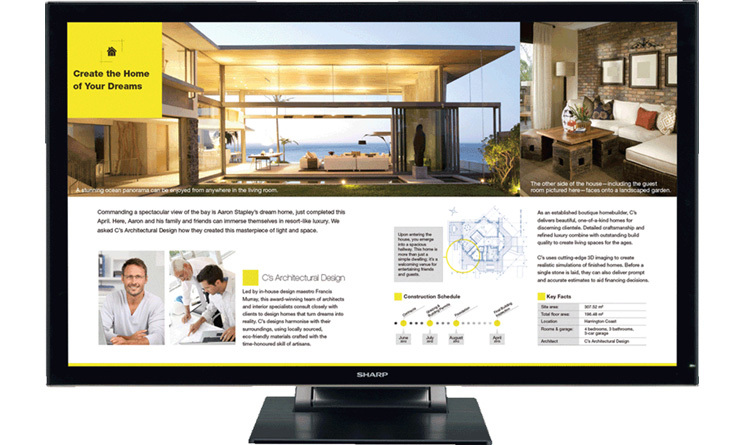 With its 32" class (31-½" diagonal) screen size, 4K Ultra HD resolution, 10-Point Multi-Touch Screen, and energy efficient edge lit LED backlight, the PN-K322B is ideally suited to a wide range of professional applications in settings where detailed information needs to be displayed with tremendous precision. This super-high resolution display boasts four times the pixel resolution of 1080p full HD, enabling users to view the content of four full HD screens on a single seamless display. Its 10-point multi-touch screen provides extremely quick response for writing and touch gestures. When connected to a device running Windows® 8, the monitor serves as a beautifully intuitive interface. IGZO* technology supports increased pixel transparency and reduced current leakage, resulting in lower power consumption. 32" Class (31-1/2" diagonal) Screen Size - combined with Sharp IGZO technology help create brilliant super high resolution color images with maximum impact. 3,840 x 2,160 4K Ultra HD - from a single HDMI or DisplayPort cable. 10-Point Multi-Touch Screen – seamlessly flush with the bezel, the PN-K322B's full-flat screen is ideal for touchscreen operations that involve swiping from the edge of the screen. Fine-Tipped Touch Pen - features an extra-small 2 mm tip that enables users to easily underline text, add notations, draw illustrations, and make amendments to onscreen content. Edge Lit LED Backlight - reduces power consumption and helps enhance reliability and legibility of text. Built-in speakers - with 2W per channel stereo audio system. Slim Design with Cabinet Depth of only 1-13/32"
3-Year Limited Warranty - covers parts, labor and backlight, in both landscape and portrait modes.